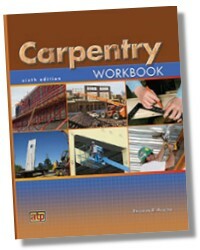 Carpentry, 6th edition, provides a comprehensive approach to step-by-step carpentry skill development with an overview of tools and equipment, materials, and proven trade practices. 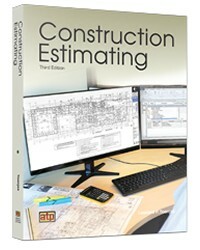 This textbook contains 70 units designed to help develop and upgrade the skills and competencies required in the trade and introduces related concepts. This edition of Carpentry has been thoroughly updated while retaining the easy-to-use approach and design of the previous edition. In addition, Carpentry includes expanded coverage of rigging and lifting equipment and procedures, adhesives, hand tools, portable and stationary power tools, building materials, hazardous material safety, green building and certifications, prefabricated panel forming systems, and column forms. 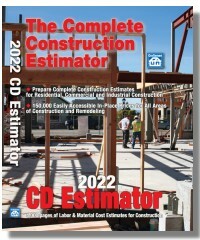 New content areas include energy auditing, high-definition surveying, building information modeling (BIM), micropiles, wind turbine foundations, composite and noncomposite concrete slabs, structural insulated sheathing, advanced framing and, lead-based paint renovation, repair, and painting program. 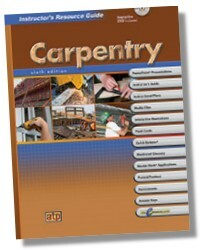 The Carpentry Instructor's Resource Guide is a valuable instructional tool designed for facilitating content in a classroom or seminar-style format. It provides an out-of-the-box approach for maximum flexibility and effectiveness.